The retina is a very thin, but complex tissue that lines the back of the eye. It is composed of millions of cells, including photoreceptor cells that sense light and send images to the brain. There are many conditions that can impair the retina’s ability to receive and transmit images. The most common retinal diseases are Diabetic Retinopathy, Age-Related Macular Degeneration and Retinal Detachments. These conditions are very serious and if not treated, can lead to loss of vision. Many retinal diseases can be treated with various forms of laser. These powerful light beams help destroy abnormal blood vessels in the retina or act to seal off retinal tears. Laser therapy is usually done in our office with anesthetic eye drops to ease any discomfort. People with diabetes mellitus have difficulty using and storing sugar properly. High blood-sugar levels can damage blood vessels in the retina. Damage to these blood vessels is referred to as diabetic retinopathy. 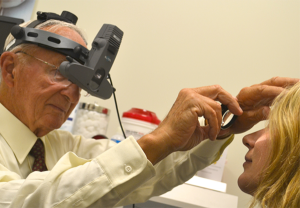 A medical eye examination is the only way to detect changes inside your eye. An ophthalmologist can often diagnose and treat serious retinopathy before you are aware of any vision problems. NPDR is an early stage of diabetic retinopathy where tiny blood vessels within the retina leak blood or fluid. Many people with diabetes have mild NPDR, which usually does not impinge on their vision. When vision is affected, it is the result of swelling or thickening of a small area in the center of the retina that allows us to see fine details clearly. This swelling is caused by fluid leaking from the blood vessels in the retina and is the most common cause of central vision loss in diabetics. PDS is present when new abnormal blood vessels begin to grow on the surface of the retina or optic nerve. A widespread closure of retinal blood vessels causes the retina to respond and grow new blood vessels in an attempt to supply blood to the areas where the original blood vessels closed. Unfortunately, the new blood vessels do not supply the retina with adequate blood flow. These new vessels are often accompanied by scar tissue that may cause wrinkling or detachment of the retina, therefore causing visual distortion or loss. PDR may cause more severe vision loss than NPDR because it can affect both central and peripheral vision. The best treatment is to prevent the development of retinopathy through strict control of your blood sugar. This will significantly reduce the long-term risk of vision loss from diabetic retinopathy. Early detection of diabetic retinopathy is key to protect against vision loss. Laser surgery is often recommended for people with severe diabetic retinopathy. Multiple laser treatments over time are sometimes necessary although laser surgery does not cure diabetic retinopathy and does not always present further loss of vision. Diabetics should schedule an exam at least once a year. Your ophthalmologist may require more frequent examinations if diabetic retinopathy is diagnosed. Age-Related Macular Degeneration (ARMD) is a disease that affects the macula, the small area in the center of the retina that allows fine details in your central vision to be seen clearly. This slow progressing condition tends to develop as you get older, hence the term “age-related”. There are two forms of macular degeneration: “dry” macular degeneration and “wet” macular degeneration. Dry macular degeneration is more common and is caused by aging and thinning of the cells in the macula. Vision loss is slow and gradual. Wet macular degeneration occurs in only 10% of patients and causes much more rapid vision loss. There is no cure for ARMD, however there are some treatment options for wet macular degeneration. Untreated wet macular degeneration can lead to scarring of the macular area and permanent vision loss. If you notice a change in your vision, i.e. telephone poles do not look straight or there is a section missing, please give our office at call at 757-410-9500 immediately to schedule an appointment. A dilated retinal examination is the only way to properly diagnose retinal problems. Serious diseases can often be treated before the patient begins to experience vision problems. In some cases, additional testing is required. One test is the Optical Coherence Tomography (OCT), which is a new technology. This device bounces light rays off the retina and the reflections are transmitted to a computer, giving us a detailed 3D cross-section of your retina. If you experience any of these symptoms or any sudden changes in your vision in general, you need to be seen as soon as possible. A retinal detachment is an emergency and requires immediate attention.